S and I spent our first anniversary in Bath, one of my favourite English towns. 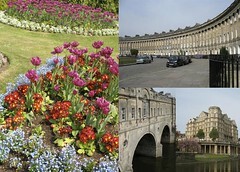 This collage features pictures from Royal Victoria Park, the Royal Crescent, and Pulteney Bridge. Click on the photo to see a larger version on flickr.